~ not many random thoughts today. My head is exploding and it’s all I can think about. ~ medicine roulette begins. I can’t eat so my regular med is out of the question. ~ I heard a rumor that snow is falling a few states over. ~ I need to get a big pumpkin today and clean off the front walkway. 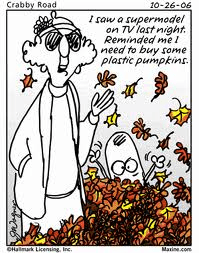 Otherwise, in the morning there will be frost on my plastic box of school decorations. That doesn’t sound as festive. ~ 2 days until the TN game. I’m ready for some tailgating. ~ ouch. I wonder if this is weather related. Anybody else get headaches when temps drop quickly or when seasons change sharply? Previous Post: « Does this shirt make me look diabetic? I always get terrible headaches when summer changes to fall too quickly. I just moved to central California from Chicago, though, so that’s not likely to be a problem again any time soon! I think that was the reason! It finally went away mid afternoon and I haven’t had another one. 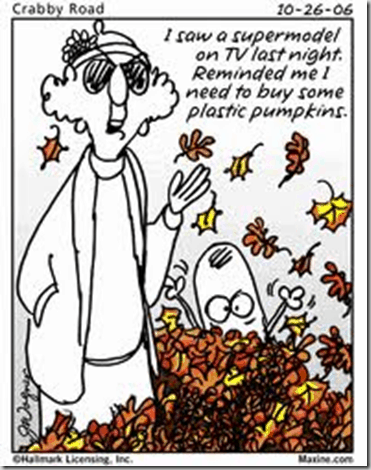 I love fall, but the headache can stay away.